Tech Mahindra Recruitment 2018 is out for the candidates who are seeing for the jobs in IT Industry. These job openings are for the fresher candidates. 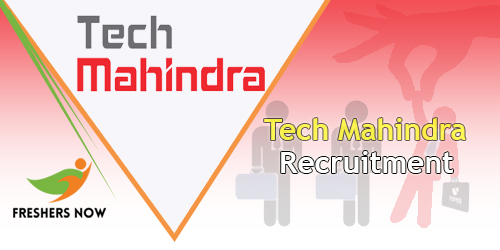 Every year the Tech Mahindra will conduct the recruitment and referral drives to recruit the contenders for the vacant positions in the organization. In the same way, this time it disclosed the Tech Mahindra Careers 2018 Job Openings for the Entry Level Engineer and IT Internship Jobs. Not only the It Jobs it has many other jobs in various categories like Networking, BPO’s etc. Contenders who are willing to work in the reputed company like Tech Mahindra can apply for the Tech Mahindra Recruitment 2018 by checking his/ her eligibility. The candidates who meet the criteria such as educational qualification, selection process, the scale of the pay, role of the job and the job location etc. If any of the applicants are having any doubts regarding the Tech Mahindra Careers 2018 can go through the official website. We are also providing the online registration Link in the following section of this page. Please check it and apply soon. Good news for the candidates who are trying hard for the job in the Tech Mahindra. This article gives you the complete details about the Tech Mahindra Recruitment 2018 in a clear manner. Most of the candidates are looking on the various websites for the accurate information. To reduce the search burden of the applicants our team had collected the data from various sources and furnished at one place. By using these particulars the aspirants can easily come to an idea and apply for the Tech Mahindra Job Openings 2018 before the closing date. Generally, the officials will conduct the recruitment drives at major cities like Hyderabad, Pune, Bangalore and the Tier II cities like Jaipur, Bhubaneswar, and Visakhapatnam. To get the job in the Tech Mahindra the applicants have to clear the written test conducting by the authorities of the company. Applied aspirants have to refer the Tech Mahindra Placement Papers and Test Pattern before heading the preparation for the exam on the Internet. Tech Mahindra Limited is an Indian multinational provider of information technology (IT), networking technology solutions and Business Process Outsourcing (BPO) to the telecommunications industry. This company is founded in the year 1986. Anand Mahindra is the Chairman of Tech Mahindra, which is headquartered in Pune and has its registered office in Mumbai. Tech Mahindra was ranked 5th in India’s software services (IT) firms and overall 111th in Fortune India 500 list for 2012. It is also one of the Fab 50 companies in Asia, a list compiled by Forbes. As the part of the Mahindra group, the Tech Mahindra is a US$4.5 billion company with over 117,000 employees across 90 countries. As of June 2017, the Tech Mahindra has 864 active clients. The applicants should be between 18 and no maximum age limit. Ability to work within the challenging environment. Ability to work with tight delivery timelines. Should be well-informed about the computer. The Tech Mahindra process consists of four rounds as given below. Every applicant has to face all the rounds as the part of the selection process. After clearing all the rounds only the candidate will be selected for the applied position. The company officials will offer salaries for the selected contenders are per the norms of the organization. Freshers can expect the attractive package benefits such as 3 lakhs to 3.5 lakhs per annum. Visit the website of Tech Mahindra i.e; www.techmahindra.com. Go to the “Career” section in the bottom of the page. A page will appear with the columns. Here select the jobs by applying filters like country, city etc. The current job openings will appear on the screen by location wise. Select the suitable position and start filling the application form. Before that, the aspirants have to verify the particulars of the role and click on “Apply Now” tab. Fill the necessary fields and submit the application by checking once. Note down the registration number available on the screen. We hope the candidates are satisfied with the information about the Tech Mahindra Recruitment 2018. We will update this page with the latest information in regular intervals. So be in touch with our website Freshers Jobs on regular basis. You can apply for IT jobs through the following link. I need job on optical fibre at north east state. I need job in finance side across India.